13:29 Swindon to Westbury due 14:10 will be cancelled. 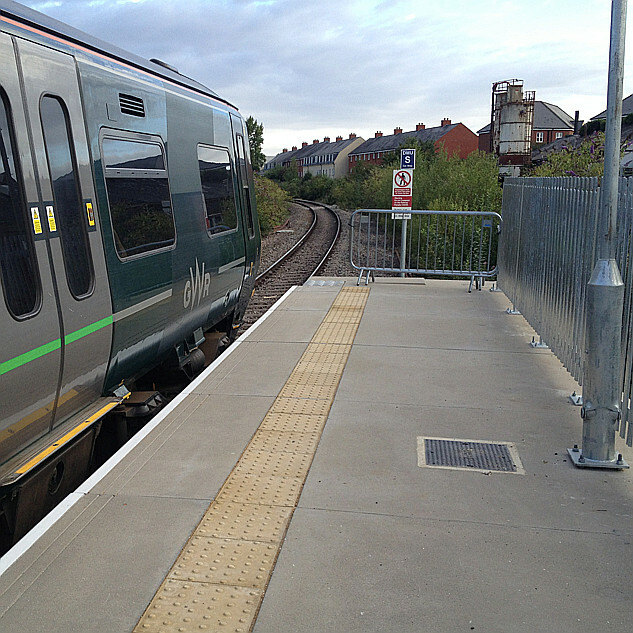 Due to a points failure between Trowbridge and Chippenham all lines are blocked. Train services running through these stations may be cancelled. Disruption is expected until the end of the day. Due to a points failure, the Great Western Railway service between Westbury to Swindon is suspended until further notice. Road transport will be operating to/from Melksham. Customers not travelling to/from Melksham are requested to please use train services via Bath Spa. Tickets routed 'Via Melksham' are accepted via Bath Spa during this disruption. 11:20 Weymouth to Swindon due 13:34 has been delayed at Weymouth and is now 14 minutes late. This is due to a safety inspection of the track earlier today. Facilities on the 09:46 Westbury to Swindon due 10:32. My heart missed a beat when a great fat sponge just came up on our map at the top of these pages between Westbury and Swindon a few minutes ago ... however, the day's shuttle train at 2 cars rather than 3 is fine for this year. Traffic is growing again and a 153 (1 car) turning up (as was regular this time last year) when it had just, supposedly, been replaced would be an issue on 4 of the services. Talking of which ... the first train was replaced by a bus in Sunday - engineering pre-planned - and I understand the bus was full and standing. Shows the importance of the Sunday morning train. Facilities on the 07:33 Westbury to Swindon due 08:15. 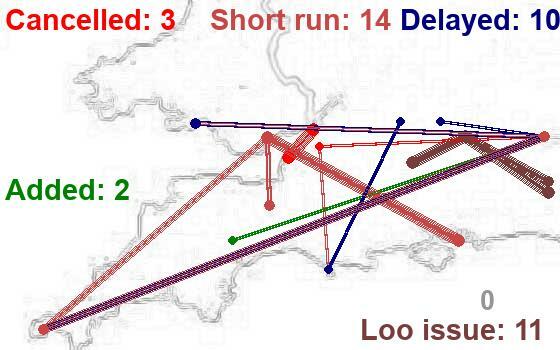 Needs two carriages on this diagram in 2019 - so this is much more of a technical / reporting issue than a problem on the line. Well, the 153s are going soon. As I write four down services qued up at Chippenham. 20:08 Swindon to Westbury due 20:49 has been delayed at Chippenham and is now 38 minutes late. This is due to a person being hit by a train earlier. Facilities on the 14:35 Westbury to Swindon due 15:19. Having said which, the first train last Sunday was replaced by a bus (planed ahead) and was reported FULL AND STANDING. With the Melksham Rail User Group ( http://www.mrug.org.uk ) increasing its marketing this year, and with TransWilts upping its paid CRO position by 50% this year too, and with much more reliable trains ... we probably will have to start worrying about 2 car v 3 car in the foreseeable future. Facilities on the 17:41 Cheltenham Spa to Southampton Central due 20:44. No problem south of Swindon .. as a peak service from Cheltenham Spa / Gloucester up the Stroud Valley, it's likely to be bursting for the first half hour to hour of it's journey. Today the 17:36 was a class 158.